Belize is where our adventures begin, Jan. 17–19, with Belize City as our base once again for our 2018 Live and Invest in Belize Conference. We’ll introduce you to your top Belize options—from the unadulterated, unpretentious Caribbean shores of Ambergris Caye… to back-to-basics living in the lush Cayo… to Corozal in the north, close to the Mexican border—an area that’s growing in popularity with expats. Belize is a tiny country, about the size of Massachusetts, with a population of just 350,000 people. The entire country is like a small town. Everyone’s friendly, welcoming, and very willing to lend a hand and to make an effort for a neighbor. Come Feb. 21–23, it’s time for the Live and Invest in Panama Conference. Here in Panama, your living options, again, are many: from the First World amenities and infrastructure of expat-friendly Panama City… to the cooler highlands where you’ll be surrounded by nature… to the stunning Pacific coast where living can be downright cheap. As we’ve reminded you often, there are two faces to Panama: Panama City (the image projected to the rest of the world) and the interior (or the rest of the country outside Panama City—including its Pacific and Caribbean coasts). If you’re at all intrigued by this tiny but significant country, you owe it to yourself to check out all your options. And, remember, wherever you choose to settle, you’re still enjoying the residency, tax, and other benefits Panama has on the table. In March, we stay in Panama… but with one specific agenda: real estate. In Las Terrenas, you can embrace the best of Caribbean living but also enjoy First World amenities and entertainment nearby, as well as an instant welcome by the large, diverse, and growing resident expat community (that’s mostly European). Plus excellent medical care and the best property buys in the region. Those are the events that are officially open for registration in 2018. But we will, of course, be returning to our favorite havens—including Colombia and Portugal—for more in-country events… and hosting another Offshore Wealth Summit and Retire Overseas Conference later in the year. And, new to the calendar this year, we’re planning our first “Global Entrepreneur Symposium”—a working title—where we’ll introduce you to work-from-anywhere opportunities you can tap into to fund your new life overseas. As soon as details are confirmed, you’ll be among the first to know. As always, please get in touch with any of your event-related questions or for personal help with your booking. 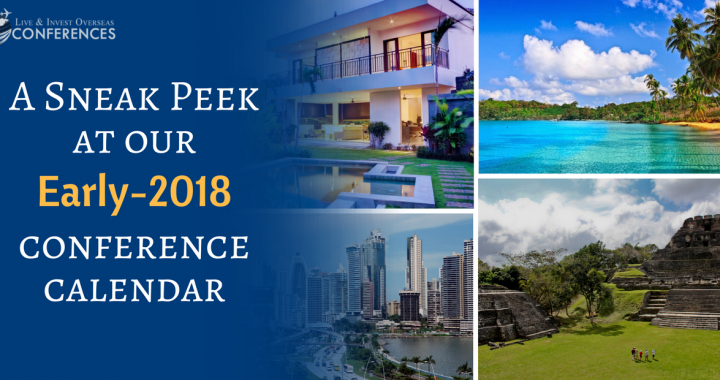 Posted in conferences, Live And Invest Overseas Confidential and tagged Belize Conference, Conference calender 2018, global property summit, live and invest overseas conferences, Valentine Fouche.